1830 - Bishop Portier's Letter - Bishop Michael Portier, first bishop of Mobile, wrties a letter to the city's mayor and alderman requesting land for the establishment of Spring Hill College. He is granted 380 acres for a fee of $400. 1830 - Fr. Mathias Loras is names College's first president. 1831 - The original faculty consists of "two professors of English language, two of the Latin and one of Spanish, a professor of Mathematics and a Director General of studies," according to Portier's "Prospectus" published in 1830. 1836 - A military company is formed and they are active as musical entertainment in parades. 1837 - Among the first graduates of Spring Hill College is Stephen Russell Mallory, best know later in life as a U.S. Senator and the Confederate secretary of the Navy. 1838 - The stagecoach from Mobile to New Orleans passes the College three times a week. It is a twenty-hour trip. 1839 - Abner Doubleday lays out the first baseball field and the first game is played. 1842 - The Fathers of Mercy, to whom the College has been entrusted by Bishop Portier, abandon the college. 1843 - The Spring Hill Lancers, the reconstituted military company on campus, is formed by former student Robert Sands. An encampment is made near the lake. Sands rose to the rank of Lieutenant Colonel before he retired from the Confederate Army in 1864. 1845 - The Eudists Fathers of Vincennes (Indiana) take charge of the College in the fall, and then leave the following spring. 1846 - Fr. J. Bazin, petitions the superior general of the Society of Jesus to take over the college. 1847 - President Fr. Gautrelet, S.J. adopts the name of St. Joseph's College at Spring Hill. 1848 - Bishop Portier presides as Anthony Jourdant and James Duffo become the first Jesuits ordained in Mobile. 1849 - Cholera breaks out in Mobile, but the College escapes the epidemic. 1849 - Roger Stwart, a Scottish cotton factor, purchases the property adjacent to the College and builds his Greek-revival home, Stewartfield, with the porch over-looking the oval race track. 1849 - Edward Troye, a famed painter of animals, especially horses, begins his career teaching drawing and French at Spring Hill. 1851 - A clock is placed in the tower of the College's building. 1854 - Paul Morphy, international chess champion, graduates from SHC with an AB (Bachelor of Arts) degree. While at Spring Hill, he gives up chess completely to focus on his studies. After graduation, he goes on to win international chess competitions and becomes known as the greatest player in the world. He retires from the chess world soon after accumulating victories in the majority of contests, and is overtaken later in life by mental illness. 1859 - Bishop Michael Portier, founder of Spring Hill College, dies on May 14. Rt. Rev. J. Quinlan is consercrated as the Second Bishop of Mobile. 1861 - The first issue of The College Album, the earliest student publication on file in the College Archives, is published. 1861 - Many of the Fathers of the College serve as army chaplains during the Civil War. 1862 - All members of the faculty are made part of the 89th Regiment of Alabama. After extensive pleas to generals and finally the Confederate Secretary of War, the faculty and students are granted exemptions to the draft-though most students are too young to be drafted. 1864 - Enrollment increases dramatically; as many parents attempt to protect their sons from the draft. 1865 - The fall of Mobile occurs on April 12, and SHC becomes part of federal territory the next day. Some 2,000 Union forces bivouac on campus and bathe in the lake. 1864 - Alumni Ernesto and Nemesio Guilló returned to Havana, Cuba brining the sport of baseball with them. They formed the Habana Baseball Club which later became the Cuban National Baseball Team. They are reconized as the fathers of Cuban Baseball. 1866 - A brick kitchen building is completed replacing a wooden structure dating to 1834. The building survives the 1869 fire and later serves as the college Infirmary. Today the building is known as Moore Hall. 1869 - Administration Building ("College") destroyed by fire on February 4. Present Lucey Administration Center erected, ready for occupancy by early winter. 1872 - A Jesuit cemetery is opened on the site now occupied by the Campus Center, the first burial being Fr. Cornette, S.J. The remains of several Jesuits buried in the old parish cemetery (south of Viragh Hall) are later tranferred to this new site. 1872 - The school's brass band is reconstitued for the first time since the Civil War. 1875 - Rev. J.F. O'Connor, the first SHC student to enter the Society of Jesus and become a priest, is ordained a priest in the college chapel. 1883 - The Turris Davidica, or "Tower of David" building is constructed and it inclueds an auditorium on the first floor, a chapel on the second, and a library. 1883 - Only 11 boys are at the opening of the school in October due to an epidemic of yellow fever in the region. Strict quarantines are in effect in nearby towns and cities, which keeps Mobile citizens from fleeing. The epidemic claims 87 lives and infects almost 300 more. The fever spares the school but causes exteremly low enrollment. 1885 - Day students are no longer accepted at the college, only full boarding students - until commuters are once again admitted in 1922. The Refectory Building is constructed. Today it houses Fine Arts and Finance. 1891 - The tradition of the publication of the college magazine, The College Album, is resumed. In it appears the earliest baseball team picture and a poem, "Our College Team." 1895 - Miller Reese Hutchison graduates from Auburn University. He is later awarded a Doctor of Philosphy from Spring Hill College in 1914. He attended Spring Hill from 1891-1892. An inventor in his own right- the acousticon and the klaxton auto horn- Hutchison become the chief engineer of Thomas Edison's West Orange, New Jersey labratory in 1912. 1900 - Spring Hill's Football team begins play. 1901 - A statue of St. Joseph donated by Major Patrick Hannon is unvieled along with an ornamental pond south of the Administration Building near the site of the Sodality Chapel. It is later placed in the facade niche of the newly built St. Joseph Chapel. 1903 - The grotto of Our Lady of Lourdes is built along with the red rick walk, Hannon Way. Stewartfield and Carolina Hall are purchased by the College. 1904 - The Natatorium is constructed. The swimming pool is late boarded over and the building used for basketball. 1905 - Electricity is introduced, illuminating the College buildings and the student dining hall. 1913 - The Cincinnati Reds visit Spring Hill and routs the College's team 11-3. 1915 - Omicron Sigma - Spring Hill's first fraternity - is founded by Matt Rice and fellow students. 1916 - The original gate to the College is constructed on Old Shell Road at what is now College Lane. 1916 - A second story over the gymnasium is completed - the College's first modern dormitory with private rooms rather than large, open areas. The building is renamed Quinlan Hall in honor of Spring Hill's "second founder." Later the same year, the 1916 hurrican tears the roof off of Quinlan Hall. 1919 - Fr. 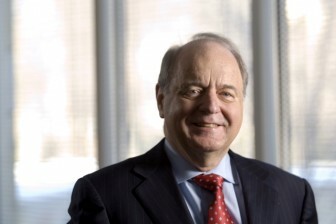 Joseph C. Kearns, S.J., a native of Kentucky, is the first SHC alumnus to become president of the College. 1924 - The First Student Council is formed. Seven students are elected to represent their peers. 1924 - Home run hero Babe Ruth pays a visit to Spring Hill where he takes batting practice with the College's team and demostrates his swing. 1924 - The first issue of The Springhillian in a newspaper formate is published, as well as the first yearbook- also called "The Springhillian." 1927 - Mobile Hall, the first building in Father Walsh's projected Greater Spring Hill completed. The Library (1930-31) and the main gate followed. 1930 - The first nine-hole golf course is officially opened. Stewartfield serves as the clubhouse. 1931 - Thomas Byrne Memorial Library is completed as part of a "Greater Spring Hill plan." The plan envisions some 15 buildings forming a seperate college campus and turning the college into a university, with the original campus given over to the high school. The plan never comes to pass because of the Great Depression. 1932 - The college launched an extension program with Saturday classes aimed at adults. For the first time women were admited as full-time students to the program. 1935 - Dorn stadium is constructed west of the Avenue of the Oaks. The Stadiums wooden benches set 3,400. Dorn is dismanted by 1944. 1937 - The first two women graduate from Spring Hill in the special commercement held at the end of the summer school - considered a separate program with its own graduates are Marie Fidelis Yeend and Genevieve Cordilia Jarvis. 1940 - The Spring Hill farm is discontinued through potates are planted in 1943 to help relieve the food shortage during World War II. 1941 - The football team plays its last game, losing to Mississippi 53-7. 1942 - The Army Air Corps takes over Mobile Hall to house 200 cadets. They leave in the summer of the following year. 1947 - African-American students are admitted to the evening division. 1948 - The golf course expanded to eighteen holes, taking over the area of the old college farm. 1952 - Helen Muscat is the first woman elected to the student council. 1952 - Fr. Roy W. "Chief" Vollenweider, S.J. makes Spring Hill his home. 1953 - The first full-time female faculty member is hired- Ella Morris, special lecturer in biology. 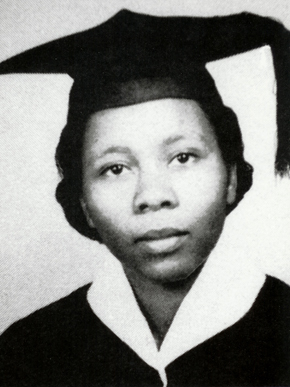 Betty Jo Stringer, the first traditional undergraduate woman, recieves a BS in biology. 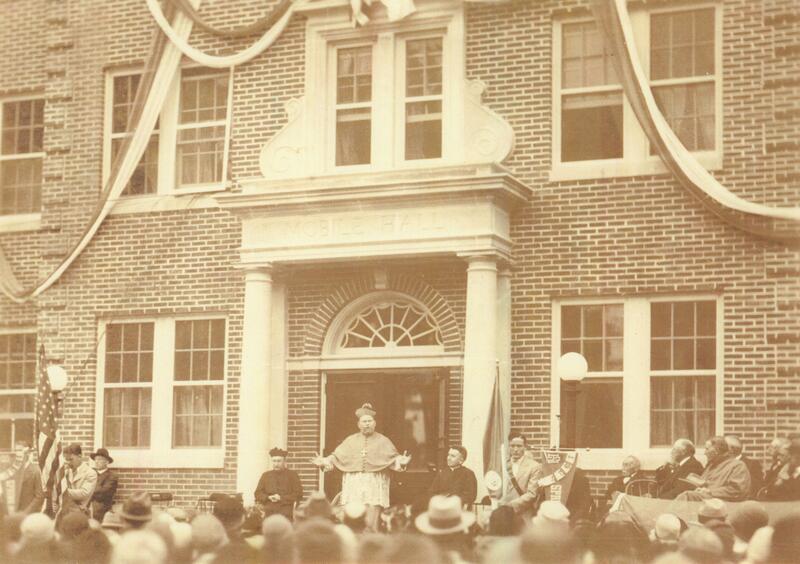 1954 - Walsh Hall is dedicated - the first new permanent building since Byrne Hall (1931). 1954- College integrated racially- picture of Fannie Smith Motley Class of 1956. She graduate with honors from Spring Hill College. 1955 - Quinlan Hall is converted from a dormitory to classrooms. 1955 - Spring Hill's basketball team wins the Gator Bowl, defeating both the University of Georgia and Florida State in the process, and earning the right to pose with real gators. 1958 - Science Complex begun with Chemistry (Deignan Hall), followed by Physics (Moore Hall) in 1959 and Biology (Yancey Hall) in 1969. 1960 - Rev. Louis Eisele, S.J. was named the director of a worldwide web of seismic stations. He invented an ink-to-paper system for recording earkquake data on seismographs. 1961 - Toolen Hall is begun - the first women's dormitory built by the college. 1962 - The College radio station WSHC begins its second year on the air. 1963 - Lee Harvey Oswald addresses the Jesuits about life in the Soviet Union 4 months before assassinating President John F. Kennedy. 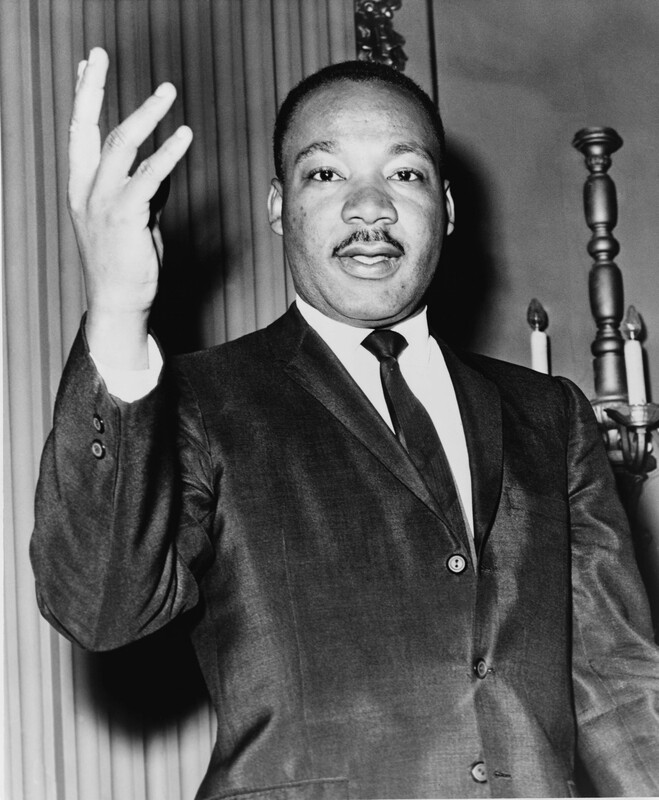 1963 - Martin Luther King, Jr. writes about Spring Hill College in Letter from a Birmingham Jail. 1964 - The Campus Center is constructed, occupying the original site of the Jesuit Cemetery, which is moved to its current location, north of the Outlaw Recreation Center. 1970 - The Springhillian wins the All-American Award for College Newspapers. 1972 - The first intramual program for women is created. 1973 - The sailing team is started at SHC, winning second and third places in several competitions. 1974 - The Quadrangle is added to the National Register of Historical Places. 1975 - The Division of Lifelong Learning is created. 1977 - A volleyball program is begun, later disbanned under Title IX, then re-institued for men and women in 2001. 1979 - Hurricane Frederic strikes Sept 12, and causes more than $1 million in damages to the grounds and buildings. The whine of chain-saws fills the air for weeks. 1982 - The Springhillians are formed as student ambassadors for the school to greet new and prospective students. 1983 - Stan Galle, longtime baseball coach, retires after 26 years with a Badger record of 302-376-1 over the course of his carerr. 1984 - Helen Demeranville graduates - the first SHC alum to win an Emmy. 1987 - A new memorial is dedicated to Lt. Stephen E. Karopczyc '65, who died in Vietnam from a sniper wound so that others could recieve medical attention. 1988 - The National Alumni Association is formed during reunion weekend. 1989 - Fr. Paul S. Tipton, S.J. leaves the SHC presidency after 17 years of service- the longest presidential tenure in history. 1996 - The Arlene Mitchell Theatre is constructed, allowing the College to take productions to a new level of professionalism. 1992 - The Badgers baseball team complies its best-ever record-a 40-15 mark- and wins the District 30 championship title. 1997 - The College's original 1830 well is rediscovered. 1997 - The women's softball team begins play. 1997 - Harper Lee, reclusive author of To Kill A Mockingbird, recieves an honorary degree from Spring Hill. 2000 - The Wellness Center is opened on the second floor of the campus center under the director of Nurse Mary York, RN, who retires in 2004 after 37 years of service to the College. The Wellness Center present location is Toolen Hall. 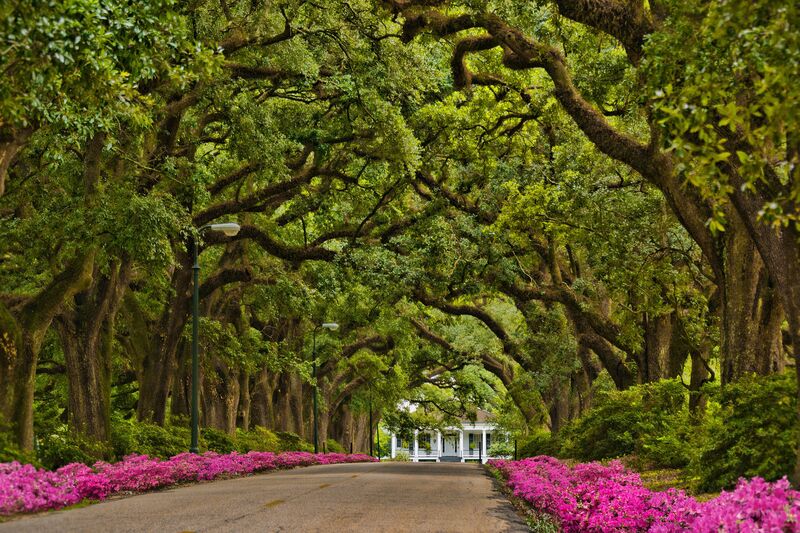 2001 - The Olympic torch passes through the Avenue of the Oaks. 2002 - Lights are installed at Stan Galle Field allowing the Badgers to play their first-ever night game on campus. 2003 - The Renovations to Quinlan Hall are completed, and Viragh Hall is Dedicated. 2004 - Renovations are begun on the old library building. It is rededicated the following year as Byrne Memorial Hall and provides a formal gathering space for campus events as well as office space for staff. 2005 - The Rites of Passage sculpture is placed in the newly created Anniversary Garden adjacent to the Chapel. The previous year, the restoration of St. Joseph Chapel is completed, Burke Memorial Library opens, and the Rydex Commons is dedicated- creating a new focal point on campus for decades to come. 2005 - The SHC nursing department led the way in our region in developing and implementing a Clinical Nurse Leader (CNL) Master's program in conjunction with the American Association of Colleges of Nursing. 2015 - Christopher Puto, Ph.D. becomes the first layman President of Spring Hill College. He is also one of the first Presidents to have graduated from Spring Hill. 2016 - Miguel Fraga, First Secretary of the Embassy of the Republic of Cuba to the United States of America to discuss the history of Spring Hill College, Cuba and College baseball. 2016 - Louis de Corail, Consul General of France to Atlanta visit Spring Hill College to discuss the history of France and Spring Hill College.